From now until the end of time, May 19, 2018, will always be remembered as one of the most iconic days in history. Of course, this was the day that Meghan Markle and Prince Harry finally became the Duke and Duchess of Sussex! As the former American actress married the royal heartthrob, a whopping 29 million people tuned in live to watch them tie the knot in a beautiful ceremony. While these numbers weren’t as high as experts expected, there are plenty more people who have now seen the lovebirds exchange their vows. Thanks to social media, people from across the world can now surround themselves with the latest information, videos and latest pictures from any major event, and that’s exactly what they did during the royal wedding. Those on the other side of the pond and those who were simply busy were able to catch up on the highlights and the most entertaining moments of their big day, and share the celebrations with the couple. While we wish we could have been there in person to wish the happy couple a hearty congratulations, we just weren’t lucky enough to be some of the 600 people who were invited to their relatively intimate ceremony in St. George’s Chapel in the historic town of Windsor. 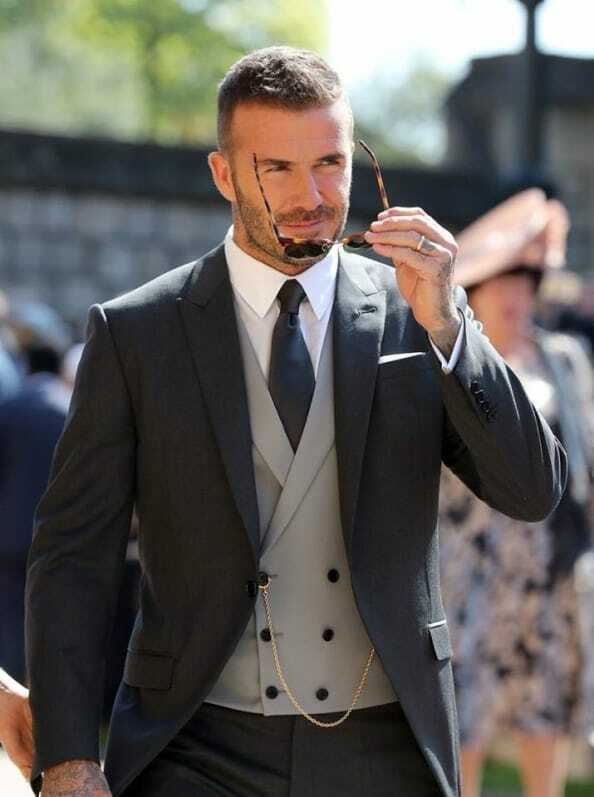 Of course, we’ve already seen that David Beckham basically won the male fashion awards at the royal wedding, but we can’t forget his wife! As always, Posh Spice was looking a little stern when she walked into St. George’s Chapel, but that doesn’t mean she wasn’t as stylish as ever. In fact, this fashion mogul designed her own dress within her own clothing line and was one of the best marketing techniques for Victoria Beckham. We don’t think anyone can rock navy quite like Posh Spice. She’s no wannabe. Although Meghan Markle is now known as the Duchess of Sussex, she is also remembered for her time on the legal drama, Suits. As the leading lady of that show, Gina Torres is kind of a big deal in the world of television – and she always dresses to impress. This was no different when she turned up at Meghan and Harry’s big day, and Gina bowled us all over with her fedora hat and her beautiful red dress. Who else could wear a fedora to a royal wedding and get away with it? If the world didn’t know who Doria Ragland was before, then they certainly do now! As Meghan Markle’s beautiful mother, Doria was the only one of her family members to attend the royal wedding, so she made sure that she represented their family with style and grace. This light green dress and matching coat was embellished with white flowers that were perfect for her daughter’s spring wedding. As if that wasn’t enough, Doria topped off the whole outfit with a simple white pillbox-style hat that added the royal touch. Welcome to the family, Doria! Although fashion fans will know Lady Kitty Spencer as the face of Dolce & Gabbana – no biggie – it’s fair to say that her appearance at the royal wedding put her on the celebrity map. This 27-year-old blonde bombshell, who just so happens to be the niece of the late Princess Diana, attended the royal wedding with her parents and her equally famous siblings, and totally stole the show with this green number. In fact, this Dolce & Gabbana floral dress was the perfect compliment to the sunny backdrop of Windsor. If you’re looking at this photograph and scratching your head, we can tell you that this really is Tom Hardy! 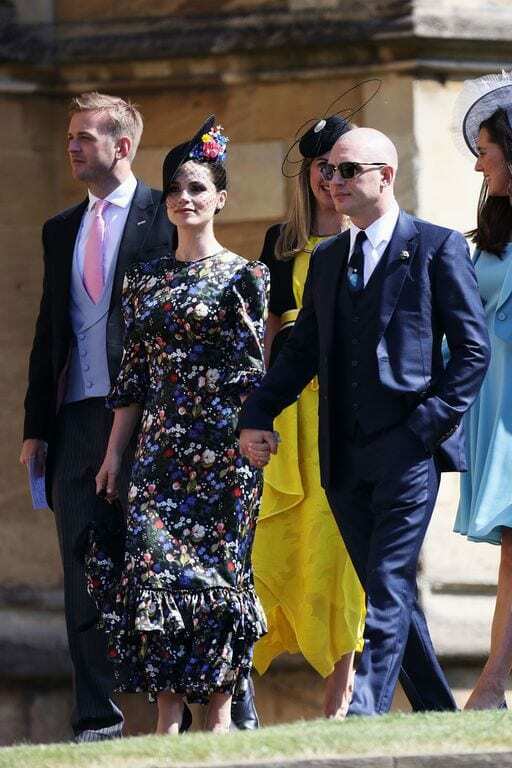 After shaving off his hair for a new role in the gangster movie, Fonzo, Tom Hardy sported a rather different look when he turned up to the royal wedding – but luckily his suit stole the show. As if he didn’t need to look any more beautiful, he blew us all away when he wandered in with Charlotte Riley on his arm. The British actress took Spring florals to a whole new level in this dress. After the events of the last royal wedding, Princess Eugenie really needed to pull her outfit out of the bag. Thankfully, this princess decided to tone down her hat choice this year and sported a pillbox style hat and dress combination that screamed Jackie Kennedy. While many have slated the princess for wearing a simple dress, this Gainsbourg design is the perfect wedding attire in our opinion. The only thing we have an issue with is the fake pockets. When it comes to clothing, either have pockets or don’t! The latest royal wedding was full of A-list celebrities, and Janina Gavankar was just one of them. As one of Meghan Markle’s Hollywood friends, you might recognize this lady for her role in the latest Star Wars movie – which means she is kind of a big deal. Those who didn’t know this actress certainly got a wakeup call when she walked into St. George’s Chapel because Janina sported an orange ensemble that definitely made an impact. Even if the dress doesn’t do it for you, we have a feeling the hat will. Could these two be any more perfect if they tried? We think not. George and Amal Clooney are two of the most famous people in the world right now, so it’s only fitting that they got a front row seat at one of the most famous events of the decade. On the big day, Amal rocked our world with this gorgeous yellow dress and hat combo, while George looked as dapper as ever in one of his famous suits. They even color coordinated with his tie and pocket square! That’s why they’re the best. After causing a stir at her sister’s royal wedding in 2011, Pippa Middleton had a lot of pressure on her shoulders to pull another cracking outfit out of the bag. Luckily, she delivered just that. 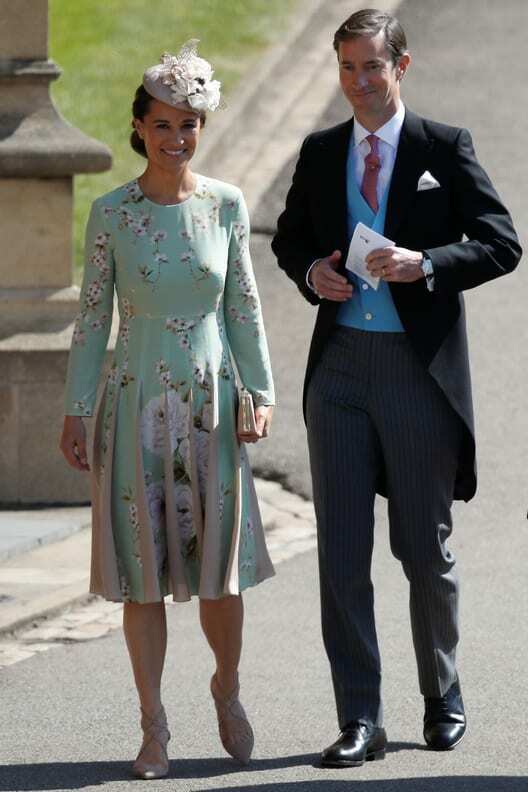 While many people have criticized Pippa for looking like a can of iced tea, we have to say that we love this dress. It’s not too in your face, it’s not too flashy, it’s not too casual, and it perfectly hides her alleged baby bump. The pleating is also a classy touch. Well done, Pippa. Considering we’ve only just about got over the hype of the royal wedding between Kate Middleton and Prince William, and the fact that they have welcomed the most adorable little princes and princess into the world these past few years, we’re not sure that our hearts can take just how perfect they looked at the most recent royal wedding. Okay, Prince George may not look too happy to be wearing his military-style page boy uniform, but Princess Charlotte looks as cute as a button. Of course, their parents scrub up quite nicely too. William looked dashing in his military uniform, and Kate looked as classy as ever in her coat dress. Can they do anything wrong? Adorable couple alert! The actress and Mumford and Sons frontman have been two of our favorite people for a few years now, but their legendary status has since been solidified after their royal wedding appearance. Marcus looked handsome in his coat and tails, which was a huge change from his everyday attire, while Carey looked floaty and feminine in her embellished floral dress. With a matching bag and headpiece, these two just have to make it into the best-dressed book. There’s no way they can’t. Although Cressida Bonas is known for being an incredible English actress, she is also known for being Harry’s ex-girlfriend. Of course, it’s kinda awkward attending the wedding of your ex-boyfriend, but Cressida made sure that she took the attention away from their former relationship and onto her appearance – because this dress is stunning. While it may not be the usual kind of dress you see at a wedding, this boho-chic dress went down with a storm with the paparazzi, and they’re still talking about it now! Also, that headpiece is an absolute beauty. We’d feel a bit bad leaving ol’ Queenie off this list – but we’re not even doing it out of respect. This outfit was truly one of the best on the day! 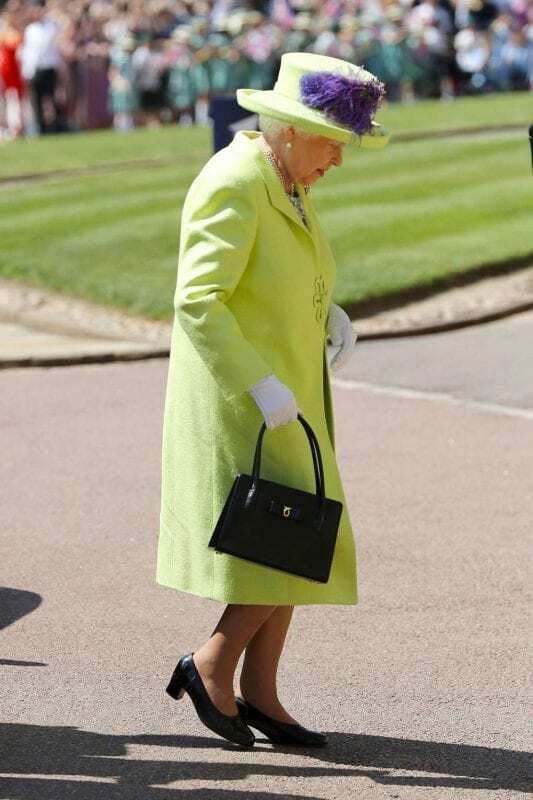 Queen Elizabeth II has always been incredibly stylish in her older years, and it’s fair to say that she stole the show when she turned up in this lime green and purple ensemble. Considering these are two risky colors to pull off, the Queen has been able to make them seem as though they’re the most natural colors of all time. You’re beautiful! You’re beautiful, it’s true! 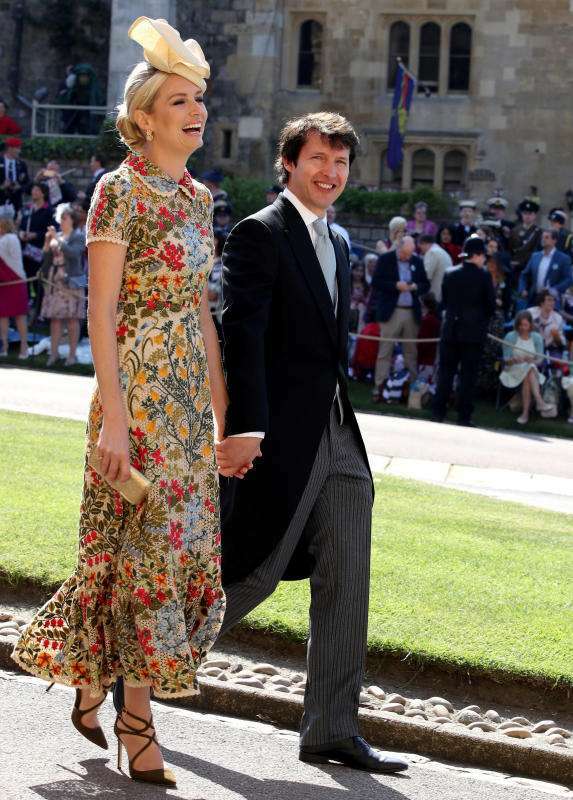 We have a feeling that James Blunt could definitely see his wife, Sofia Wellesley, in the crowded place of St. George’s Chapel during the royal wedding, because she looked absolutely stunning! Obviously, the singer looked dapper himself in his waistcoat and striped pants, but Sofia definitely won us all over with her peplum floral dress. Like many of the other women on the big day, she also topped the whole outfit off with a quirky fascinator that perfectly matched the floral pattern of her dress. It’s fair to say that Idris Elba is THE man of the moment in Hollywood right now. The British actor has proved to be hugely successful over the pond, and he looked as handsome as ever when he walked into the chapel with his Gucci suit in tow, but it seems things got even better for Elba throughout the day, as he later took on the role of DJ in the evening! As if he wasn’t perfect enough, he also seems to have impeccable taste in women, because his partner Sabrina Dhowre looks equally stunning. Over the years, Camilla Parker Bowles has shown off her fashionable side, and this came out in full force during the royal wedding. 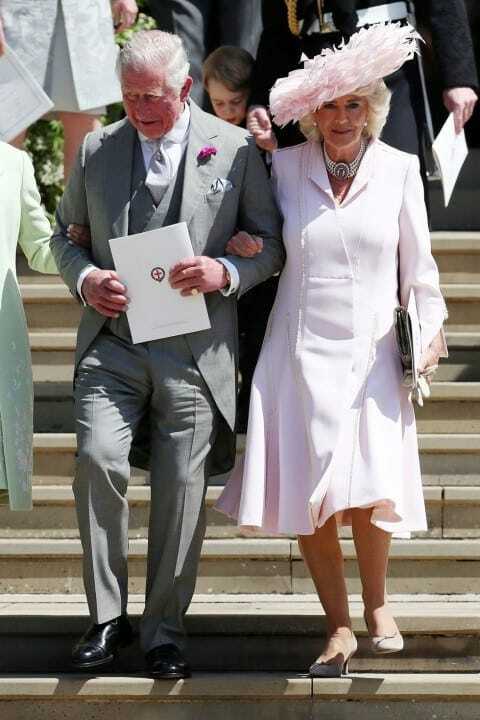 Wearing a powder pink dress and coat combination, Camilla looked absolutely beautiful as she walked down the steps of the chapel on the arm of Prince Charles. She finished her outfit off with a statement necklace, as well as a feathery hat that definitely took the title as the biggest one of the day. It seems that Prince Charles scrubbed up quite nicely, too! Does David Beckham’s inclusion on this list even need explaining. We’ll just give you a few minutes to take in this photo. At 43, David Beckham is definitely not the spring chicken he used to be, but many have suggested that this former soccer player is like a fine wine, since be only gets better with age. Although he wore a simple(y stunning) suit and jacket, fans and followers of the wedding just couldn’t get over his appearance. In fact, he was trending on Twitter for days after this sunglasses incident! As one of Meghan Markle’s best friends, we all knew that Priyanka Chopra would be attending the royal wedding, but we didn’t know in what capacity. Although it was eventually determined that she wouldn’t be a bridesmaid, that didn’t stop Chopra from making an impact on the big day. This lavender skirt and jacket outfit perfectly accentuated her figure – but the cowl neckline and the giant hat added a bit more style and modernity to the whole thing. This one is definitely a winner! It was a well-known fact that Serena Williams was invited to the royal wedding – and that made us pretty excited. After all, the fact that she is good friends with Meghan Markle is quite possibly one of the best things ever. On the day, things got even worse for our excitement levels when Serena turned up in a beautiful blush pink ensemble. While it may be a simple dress, nothing ever looks simple on Serena Williams… especially not with that fascinator. We’ll remember this outfit for years! You get a best-dressed award, you get a best-dressed award, and you get a best-dressed award! As soon as we heard that the legend herself, Oprah Winfrey, would be attending the royal wedding, we knew that she was going to make a statement. Apparently, we must be psychic, because she took the world by storm. As if this lady wasn’t perfect enough, it seems as though this beautiful pink dress was actually made the night before the wedding by the team at Stella McCartney in lieu of an off-white number that Oprah had realized at the last second would have photographed as white, thus potentially looking like she was trying to compete with the bride. Don’t worry, O, we ‘d have known that wasn’t your style.